At a moment of great vulnerability, leaving my Protestant pastorate and returning to the Catholic Church, God gave me a father to greet me and guide me back home. Father Michael Scanlan, TOR, along with Bishop Paul Dudley teamed up to give me the guidance, wisdom, and encouragement to make the move. 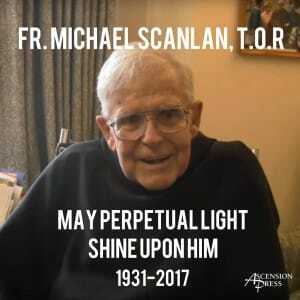 Not only did Father Scanlan encourage me in my first months back in the Church, but he quietly made it possible for me financially to study at Steubenville as he created a scholarship for me. For the first two years after returning back to the Church, Father Scanlan continually reminded me that I was not alone and that he would stand with me during the transition. I owe so much to this dear man of God. I really don’t know what I would have done without him. Even as a Protestant pastor, I followed him, admired him and learned much from him. I never knew that one day he would guide me with his wisdom through the toughest transition of my life. As I got to know Father Scanlan throughout the years, we were able to share pilgrimages together. I especially remember going to the Holy Land with him. In the early hours of the desert morning he challenged me to a race to the top of Mt. Sinai. He won! Now, he has truly won as he is being embraced at the summit of all summits, the beatific vision. I love you Father Michael and I truly want to emulate your walk with Christ. I owe you much!